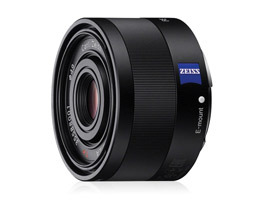 The Zeiss Sonnar T* FE 35mm f2.8 ZA is the smallest of five new full-frame E-mount lenses to accompany Sony’s full-frame mirrorless 36-Mpix Alpha 7R and 24-Mpix Alpha 7 cameras. With an $800 price tag it’s a premium model consisting of a high-grade optical construction with 3 of the 7 elements (arranged in 5 groups) being double sided aspheres – that’s a total of 6 aspherical surfaces. As well a rounded 7 diaphragm with 7 blades it features internal focusing (with no extending or rotating barrels) and has a minimum focusing distance of 1.15 ft. (0.35m) Like others in the range there are no distance markings (or depth of field scale) on the barrel, but it has a metal outer shell complete with dust and moisture resistant sealing. Best of all perhaps it weighs just 4.23 oz (120g) and measures a miniscule 1.44 “ (36.5mm) front-to-back, and comes bundled with a rather neat lens hood (but a case is extra). 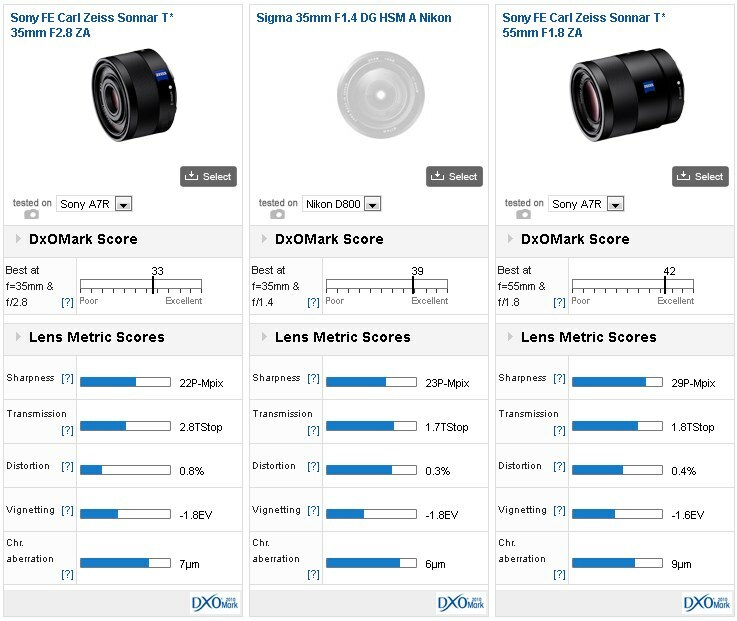 The Zeiss achieves a DxOMark lens score of 33 points, an upper mid-to-high score, but perhaps slightly lower than we were expecting. Sharpness is very good bordering on excellent in the center wide-open but even with a modest f2.8 initial aperture the sharpness falls off gradually at the periphery out to the corners, accounting for around 10% variation across the image field. Stopping down improves sharpness across the field but the same characteristic fall off in sharpness is repeated at f4 and to a slightly lesser extent at f5.6. 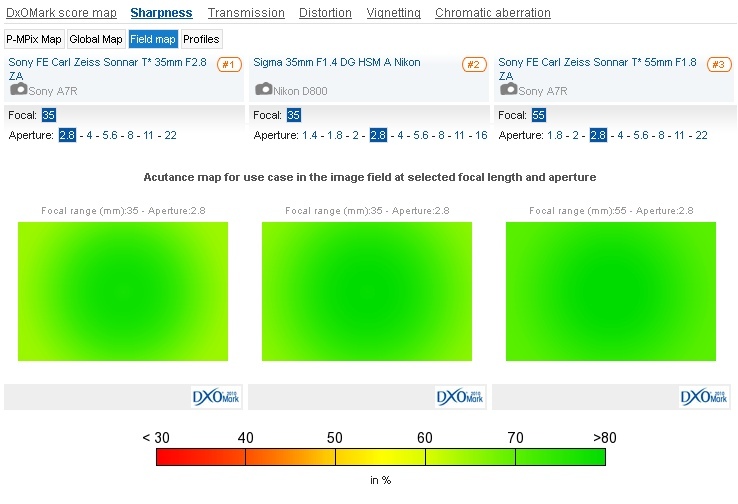 Optimal performance is achieved at f5.6-f8 though the softening effects of diffraction can be seen at f11 and onwards. Chromatic aberration is well corrected across much of the frame save for the corners where it’s evident at all aperture settings albeit at successively lower levels throughout the aperture range. With a modest maximum aperture you might expect vignetting to be a non-issue but in fact vignetting is quite heavy and, while it progressively lessens as it’s stopped down, it never really clears up. Distortion is a little higher than we would expect as well. The Zeiss has very good control of CA centrally though there’s some fringing evident towards the corners. Until we see a 35mm Otus from Zeiss, the best-performing prime lens in that focal length is the Sigma Art-series model. It’s only slightly sharper, though, with a peak sharpness of 23P-Mpix on the Nikon D800 (albeit with AA filter – we’ve not yet tested the Nikon D800E) but it has marginally better peripheral and corner sharpness at f2.8 than the Zeiss (Nikon D800E should score a significantly higher score). That trait continues through to f11 although the Zeiss gradually improves in acuity to that point. Bear in mind that neither of those two models compare with the consistent sharpness of the Sonnar T* 55mm f1.8. It’s sharper in the periphery from the initial aperture and sharper across the frame than both models at f2.8, albeit mainly in the borders of the frame. 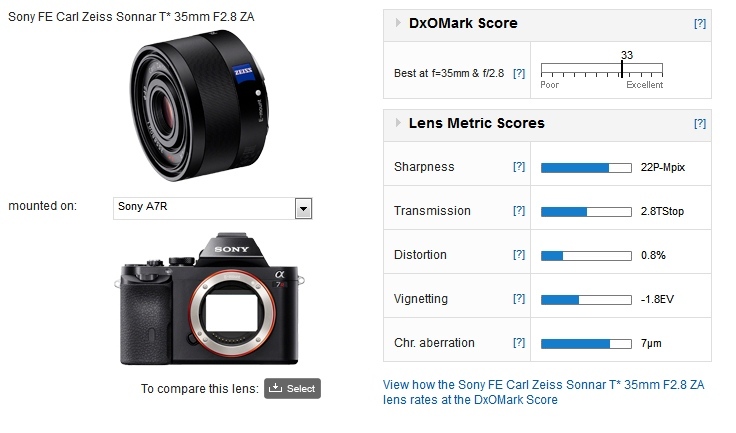 Compared to the Sigma, the Zeiss 35mm f2.8 has higher distortion and higher levels of vignetting. In fact the Sigma has virtually no vignetting at f2.8, but that’s the price you pay for such a compact design. 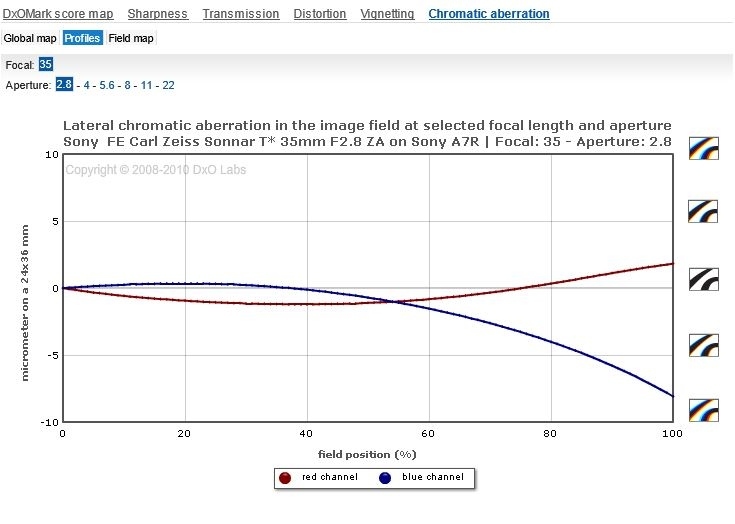 As for lateral chromatic aberration the Zeiss has better control generally though both models reveal similar levels of fringing in the corners. Full aperture performance of the Zeiss Distagon T* 35mm f2.8 ZA is very good but it’s asking a lot to match the Sigma 35mm f1.4 and Zeiss 55mm f1.8 at the same aperture value. Although the Zeiss FE Sonnar T* 35mm f2.8 ZA doesn’t have the consistent performance and sharpness in the outer field of its sibling the ZE Sonnar T* 55mm f1.8 ZA, the fact that it is very close to the Sigma 35mm f1.4 DG HSM A in IQ (over the same aperture range) is a plus. On the downside, it lacks that model’s versatility in low light, naturally, but at least it’s a fraction of the size and weight and complements the small size and inherent portability of the A7 models.